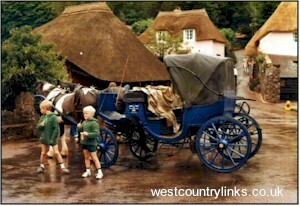 Hotels Devon Holiday Cottages West Country. Here's a selection of Devon hotels, bed and breakfast, b and b, and various accommodation available. Great deals on Devon accommodation, Devon weekend breaks, and more. Book a Devon Hotel the best online deals and discounts for rooms in Devon, hotel reservations, mini breaks, luxury accommodation and weekends away. Devon weekend breaks, and more. Great for bank holidays or short breaks. The Dartmoor Lodge Ashburton Situated midway between Exeter and Plymouth, nestled on the edge of Dartmoor National Park and the town of Ashburton, enjoy a visit or a stay at The Dartmoor Lodge. This friendly and comfortable hotel provides the perfect base from which to explore this breathtaking part of the country. Please note that for your comfort, all our rooms are strictly non-smoking. Golden Lion House Ashburton Four delightful rooms in a superb Georgian property steeped in history and located in the heart of Ashburton. Our lovely large rooms offer the highest quality accommodation for visitors or business travellers, with comfy seating areas, televisions and en suite bathrooms. Private parking,wi-fi internet access. Belmont Cottage, Ashburton, Devon. sleeps 6.Enjoying a quiet location within Dartmoor National Park, this immaculate detached 200 year old cottage is set in a superb walled garden with lovely rural views. Ashburton is an ancient stannery town, ideally placed for exploring country and coastal attractions. Buckfast Abbey, Dartmoors Buckland Tor and River Dart Country Park are all about 3 miles. Shop and pub 400 yards. Cranberries Axminster specialise in luxury self-catering holidays, pampering breaks and private corporate accommodation and activities. We are a family run business, aiming to provide you with a luxurious vacation in an area of outstanding natural beauty, a haven you will want to return to year after year! The beautifully converted stone barns are nestled high on the hill, overlooking the picturesque Axe Valley with views of the Jurassic Coastline and surrounding countryside. Yarde Cottage Churchill, Nr. Axminster, Devon. sleeps 2. Full of rustic charm, this little stone cottage enjoys glorious rural views from its secluded vine clad terrace, across the sloping garden to the wooded hills beyond. Simply furnished, it adjoins the owners 18th century home, and is set within 7 acres of grounds a haven of peace and tranquillity, sited 1 mile up an unmetalled bridleway on the Devon/Dorset border. Public footpaths direct from the bridleway make it an ideal walking base for dogs and their owners. Devon Cottages Cosy properties in delightful settings, town or country. The Park Hotel Barnstaple is set in a quiet corner of the bustling market town of Barnstaple. When you stay at the Park Hotel, as with every hotel in the Brend group, you are assured the very highest standards of cuisine, comfort and service. Add that to our warmest west country welcome and you will feel at home right away. The Park Hotel has 40 luxury bedrooms, each with an en suite bathroom, colour TV and tea/coffee making facilities. The bedrooms vary in standard, some of which a have a fantastic outlook over Rock Park. The Royal and Fortescue Hotel. Barnstaple is reputedly England's oldest borough, and has gained consistent recognition in the annual Britain in Bloom Competition, culminating as winner of the World in Bloom title - an outstanding achievement! Situated in the town centre, the Hotel offers all modern facilities while retaining its original charm and character. All bedrooms have bathroom en-suite and the lift provides easy access to all floors. The Barnstaple Hotel. The hotel's lounge area, with leather sofas and contemporary decor, is the perfect place to put your feet up, and serve equally well as an area to catch up with friends, family or colleagues. You have the option of 2 excellent eating experiences at the Barnstaple Hotel. The varied restaurant menu makes use of local ingredients and the Sunday carvery is particularly popular among residents and guests alike. The stylish minimal interior design creates a modern feel and creates an ideal setting for you to enjoy a memorable meal in. The Royal Hotel Bideford. As 'The Little White Town's' finest hotel, The Royal sits proudly at the eastern end of Bideford's ancient stone bridge. The bridge may have been here longer but it's still no surprise that this comfortable, cosy hotel has been welcoming and inspiring guests for over 200 years. As a base, The Royal Hotel is great for exploring the winding streets of Bideford, cycling the Tarka Trail or the beaches and countryside of Tarka country. You can visit Westward Ho!, the only town in Britain to be named after a novel. Durrant House Hotel Bideford. From the moment you step into our lush beautiful Mediterranean style lobby and experience the beauty of marble floors, lush greenery and colourful flowering plants, with the soothing sound of running water from our stunning copper Willow Tree water feature, you'll know you've come to the right place to relax. The Durrant House Hotel is situated near the little white town of Bideford North Devon. Tantons Hotel Bideford. Located at the heart of the historic market town of Bideford, adjacent to the town centre and situated on the river front opposite the ancient stone bridge. The hotel is perfectly situated for both business and pleasure. An historic, grade II Listed building, gracefully brought into the 21st Century whilst retaining its 18th Century features and charms, Including salvaged oak beams and bay sash windows. Edgemoor Country House Hotel Bovey Tracey. Situated right on the National Park Boundary of Dartmoor, this beautiful Victorian country house hotel, built in the 1870s, was once Bovey Tracey Grammar School. Boasting an award-winning restaurant and fireside bistro which have won several rosettes, ribbons and other UK food awards, and an extensive and creative wine list (featuring over 150 selections), this privately owned country house is less than three miles from the main A38.Ideal stopover for Exeter Airport. Quayside Hotel Brixham. Delightfully situated overlooking picturesque harbour. Superb restaurant specialising in freshly caught fish and local produce. Friendly local pub serving excellent bar food with live entertainment at weekends. Beautiful coastal walks, close to the Marina and golf nearby. Ideally situated to explore the delights of South Devon. Kindly note that we ask for a minimum stay of two nights over a weekend. Seacove Fishcombe Road, Brixham, Devon. sleeps 4. Set just 100 yards from glorious sand and shingle Fishcombe Cove, these single storey properties are two of a group of five perfectly placed to enjoy the myriad charms of Brixham a bustling fishing port much loved by artists. Dartbridge Inn Buckfastleigh. Situated within easy reach from the A38 route between Exeter and Plymouth, it’s definitely worth a visit or stay at The Dartbridge Inn. Nestled on the edge of Dartmoor National Park and the beautiful River Dart just opposite, and close by to Totnes, the Dartbridge Inn makes its own picture postcard. The Red Lion Hotel Clovelly. Idyllic, is the only way to describe the harbourside setting of this charming 18th century inn, where this famous fishing village forms a spectacular backdrop. Bedrooms are stylish & enjoy delightful views. The inns relaxed atmosphere is conducive to switching off from the pressures of modern life, even if the harbour comes alive with the activities of local fishermen during the day. All rooms have sea or harbour views. Whenever you choose to come and stay, you can be sure of the warmest of welcomes at The Red Lion Hotel. The Two Bridges Hotel Dartmoor. Highly recommended Country House Hotel set in a stunning riverside location within its own 60 acres of private grounds, watch out for the geese ! Beautiful bedrooms with views across Dartmoor , many with four poster beds and double spa baths. Enjoy the wonderful cuisine served in The Tors AA Red Rosette Restaurant, the emphasis is on using seasonal local fresh produce. Relax in the cosy lounges in front of the blazing log fires. Dart Marina Hotel Dartmouth is situated on one of the most spectacular estuaries in Europe. Providing stylish accommodation and offers complete luxury. All bedrooms are beautifully contemporary in style since a recent refurbishment including bedrooms lounge and reception areas. The River Restaurant has a unique flavour of the sea. Fresh fish and shellfish arrive here daily from Dartmouth quay and nearby Brixham. Buckerell Lodge Hotel Exeter. This relaxing and comfortable 4 star hotel completed a full refurbishment in May 2008, and has all the charms of a country house setting just 1 mile from Exeter city centre. Set within four acres of mature tree lined gardens and grounds shielding visitors fom the outside world, the Buckerell Lodge is an elegant building that provides a personal and professional service, with the added value of complimentary on-site car parking and free wi-fi throughout. A delicious range of food & drink is served all day in the garden, bar, lounge and restaurant, in addition to 24-hour room service.